Duhat (Syzgium cumini (L.) Skeels) is a fruit tree of wide distribution in the Philippines and other tropical countries. The fruits occur in loose cluster, having variable shape from ellipsoid to ovoid, with pulp color ranging from grayish white to purple. It is harvested during the months of March until June. 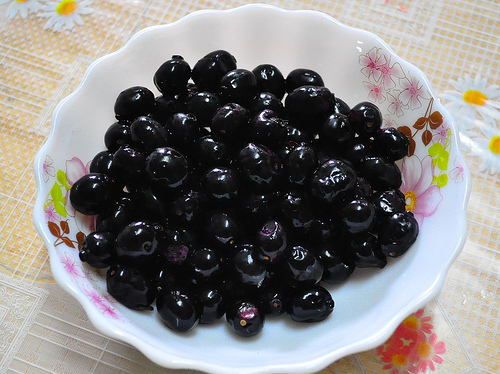 Duhat fruit is rich in antioxidants. Duhat wine has purple-red color, aged in glass vat for at least 6 months. The wine has distinct fruity aroma and smooth flavor that provides consumers with a delightful experience. Pasteurize 10% of the total volume of the “must” in boiling water for 30 minutes. Cool to 40-45oC. Inoculate with pure culture of wine yeast. Ferment for 18-24 hours and inoculate in the prepared “must”. Wash fully ripe fruits (1.0 kg) and drain. Macerate by hand or use a fruit pulper. Add appropriate volume of water (2.0 L) and adjust sugar content to 20oBrix (dry wine) or 25oBrix (sweet wine) by addition of refined sugar. Add 5ml of 10% sodium metabisulfite per gallon of “must” to destroy spoilage microorganisms. Cover the jar properly and stand for 16-18 hours at room temperature. Add the starter and ferment for 4 days. Filter the “must” to separate the seeds and pulp. Transfer the liquid in clean fermentation jars and cover with fermentation lock. Continue anaerobic fermentation for 3 weeks. Siphon the wine using tygon tubing. Care must be exercised not to make too much movement on the jar so as not to disturb the sediments. Add 5ml of 10% sodium metabisulfite per gallon of wine. Fill the jars with wine to its brim and cover tightly to prevent access of oxygen. Store in cool (20oC), dry place for at least 6 months to mature. Place in clean wine bottles and cover with cork or similar closure. Seal with paraffin- glycerin mixture or plastic seal. Finally, cover the bottle with a cap seal. This publication is an output of the DA-BAR funded project on “Technology Commercialization and Packaging Development of Wine from Selected Local Fruits” being implemented by the Institute of Food Science and Technology, College of Agriculture, University of the Philippines Los Banos.